This is not a photoshop exercise, this is a real vehicle! No, really, it really drives and is usable on actual city streets and everything. 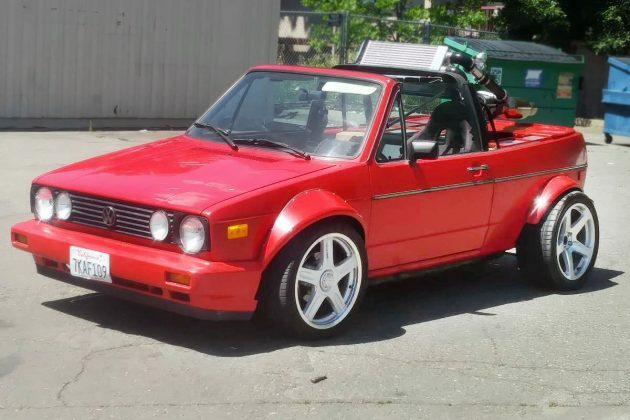 It’s a 1979 Volkswagen Rabbit Turbo custom convertible and it’s not for the faint of heart. 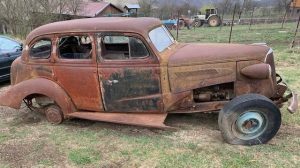 It can be found on Craigslist for a mere $3,500 in Sacramento, California. This looks like a movie car to me, like something that was specifically made for some cartoon superhero to drive on his/her way to fight crime, or whatever cartoon superheros do. For such a mind-blowing amount of work, and once you dig in to this car you’ll see that it was quite a project, I would have run to Pep Boys to get some sort of generic trim strip for the passenger door. But, if that’s the only thing wrong with the exterior, this is one heck of a car; and it is. 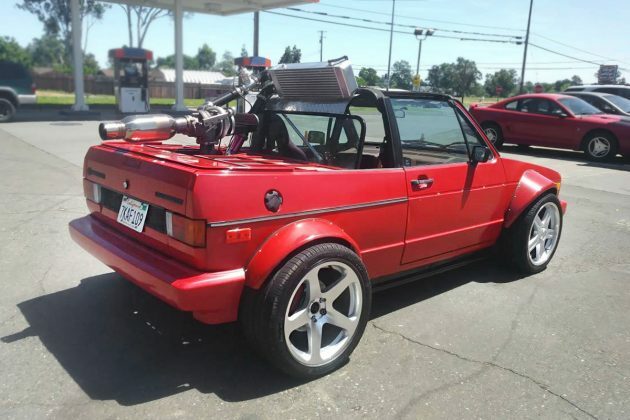 This custom Rabbit would appear to have been an incredible amount of work, being a mid-engined, V6 turbo-powered Rabbit ragtop. But, and this is not to minimize the amount of work and fabrication and engineering involved, this is basically a Rabbit dropped onto a Pontiac Fiero chassis and drivetrain. I don’t know if I could drop a a fried egg onto a pancake so to see this amount of work is mind-blowing to me. Kudos to the builder, and kudos to them for showing some of the design and build process here in this blog. The interior is a bit of a mix-and-match, but come on, $3,500 won’t get you an engine rebuild on your ’04 Camry let alone an entire crazy vehicle like this one. 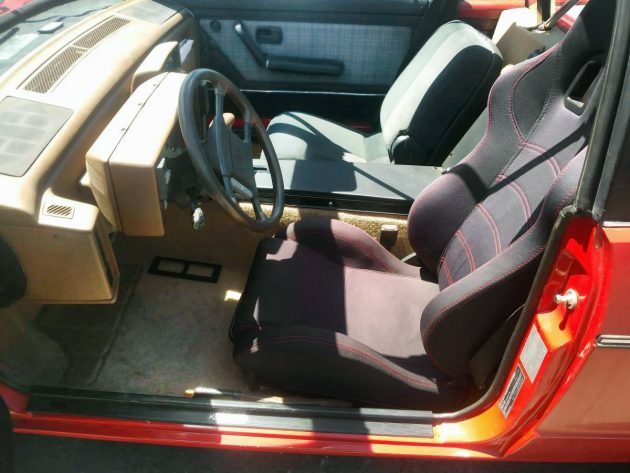 This car has an automatic transmission, and with all that went on I wonder why they didn’t start with a manual Fiero or convert it to a 5-speed along the way. I can’t imagine too many other vehicles that would draw as many people as this one would. You knew that the engine was behind the seats, didn’t you? And that it’s a turbocharged V6? So, basically, six-inches from your head is a scowling, resonating L67 3.8L turbocharged and intercooled V6. I’m not sure of the horsepower numbers, but man, that is just steam-punk cool! THIRTY-FIVE HUNDRED DOLLARS! Try and find a 10-year old Hyundai for that much. Ok, you probably could, but why would you want to. 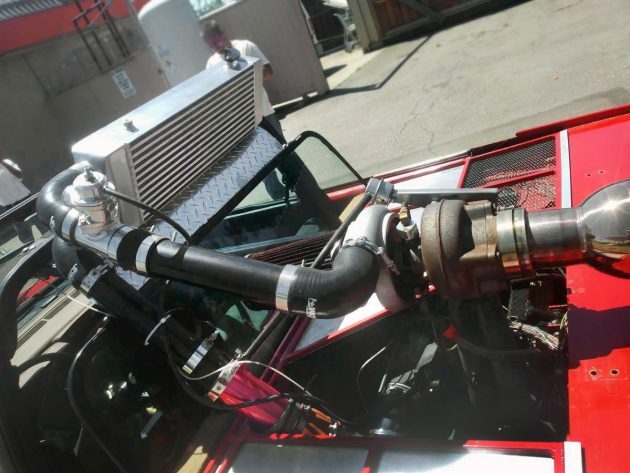 This creation “runs and drives great” and, oddly, it’s smog-exempt because it’s registered as a diesel. How ’bout this one for $3,500? That seems like a sure-fire way to be the most-popular person at the next Cars and Coffee. I think there was a Hot Wheels made like this at one point. Diesel? 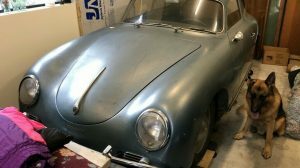 So it started life as a sedan and is now more a speedster than convertible. (Droptop? They dropped the top in a dumpster?) wifey says scary! Perhaps I’ll have to have a look! Thanks Scotty! I actually like it!! Too funny. Would love to hear what it sounds like. Diesel..much more toxic..right by your head? In Cali. Where silicon valley sits. Its good that SiliValley has competition elsewhere. Away from the stench of smog. Where brains still can function. 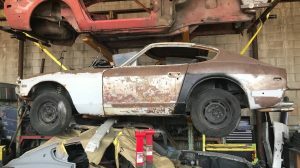 Shoulda torn the barn down with this “barn find” inside. Makes the Pinto look like a deal. Just because you can, doesn’t mean you should. This is proof of that statement. I wonder if the builder of this hangs out with the guy who built that Canadian 37 Ford resto-mod? Old guys and those that don’t get it need to understand there is a huge following for mini, micro, import and yes, tuner cars. For those that hate there are just as many who can appreciate them. Great find. I have a Nissan Micra( I don’t think they’re available in the States). The name should tell you it’s a small car. I wouldn’t do to my little car, what has been done to this thing.I wouldn’t mind adding a giant wind-up key to the roof ,though! 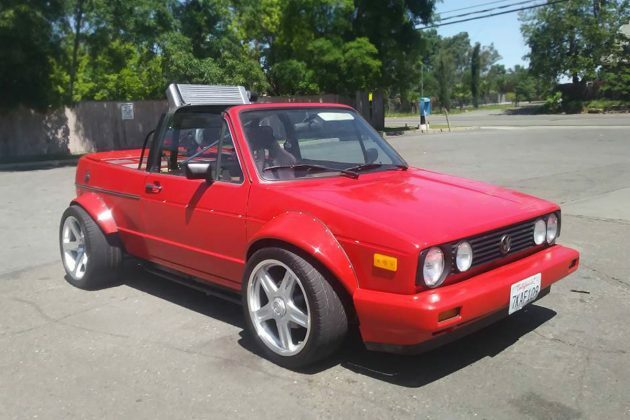 I am an “old guy.” I own an ’87 VW Cabriolet; bought it new. I also own an ’05 MINI Cooper S. I think I “get” that there is a following for small cars. What I don’t get is automotive butchery. As an old guy who owns Minis (both new and original), I do get the attraction of small cars. And I’d be happy to see a VW V6 driving it. But a FIERO? Now, if he’d dropped a Fiero body onto a Rabbit, that might be interesting. And judging by the clearance between the rear tire and the fender flare, the majority of suspension might be down to tire sidewall flex.So, although it’s not to my taste, kudos to the builder and his skill. It needs a set of 22’s on it to complete the look. I usually appreciate cars of all sorts, but I feel the guy ruined two cars to make this. It’s also not perfectly aligned, as you will learn if you visit the link provided. 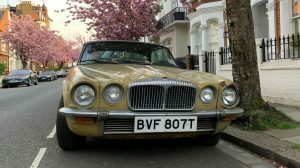 He’s tried selling this in the past on ebay, and other places – originally asking ridiculous amounts of money. I wouldn’t go near this based on what was done during the process.